Mike Fiechtner Photography || Seattle Wedding, Family and Senior Photographer — Is flickr worth my time? Is flickr worth my time? If you're not aware of what flickr is, it is a website where people can share photos that they've taken with people from around the world. As a user of flickr you are able to post pictures and leave comments on photos of others, save your favorites. You post your photos to certain groups pools that may fit a certain theme or there are other groups that require you to post a certain number of comments to users of those groups for every picture you post to the group. I think it was these groups that first got me thinking about flickr and what I wanted to get out of it. Another thing that most people who post to flickr try to do is get there photos on "Explore". Explore is basically the top 500 pictures for each day. Flickr has developed an algorithm or "magic donkey" as people on the site call it that determines what these 500 photos are. So basically it has nothing to do with which photos are truly the best. There is a lot of speculation on what kinds of things help get your photos on Explore such as number of comments, comments from your contacts, not posting to the groups that require you to award a certain number, or the number of people that call your photo a favorite. When I first started taking pictures almost a year ago I started posted my favorite pictures on flickr and was trying to get them on Explore and get lots of comments from people. I originally thought I'd get feedback both good and some criticism but this is where I was very wrong. One of the things I've come to learn is flickr is basically a website to have your photography ego stroked by everyone else. At first it was great to get lots of comments and I won't lie it is still nice but after a while I just noticed that people post positive comments about photos that are not really that good. Don't get me wrong I think there are a lot of amazing pictures on flickr and there are a lot of positives to the site but I wish there was a little bit more constructive criticism. As I continue to post photos to flickr I try to provide not only positive feedback but constructive criticism. I have so much more to learn about photography and flickr is definitely not a website that I'm going to learn what I can be doing better with my photography. So with this post I ask you as the readers of this blog (not sure who is reading this) to give me some feedback on this photo? Post a comment and let me know. 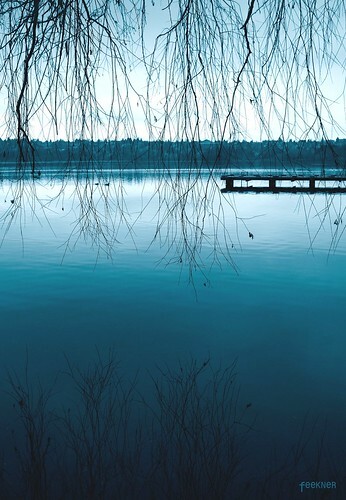 This was a photo from Greenlake which I turned into a duotone. I liked the reflection in the water and wanted to capture the feeling of the branches trying to touch each other like fingers. I really want to improve my photography but I'm not sure where to focus my efforts or where to get that feedback on my photos.